We all know there are certain natural laws you cannot defy – gravity, for instance, alas. The laws of housework are no exception. You can try, but it’s likely to leave you sobbing in a pile of crumbs and dirty socks. There may be others, but here are those I know. As soon as you finish cleaning the kitchen, someone will come in to make a sandwich. For every item of laundry you wash, there will be an equal and opposite piece of dirty clothing deposited on the floor of the utility room. The one item of laundry your child needs for the day will be the one you didn’t wash. The amount of time you have to run an errand is directly proportional to how much gas is in your tank. 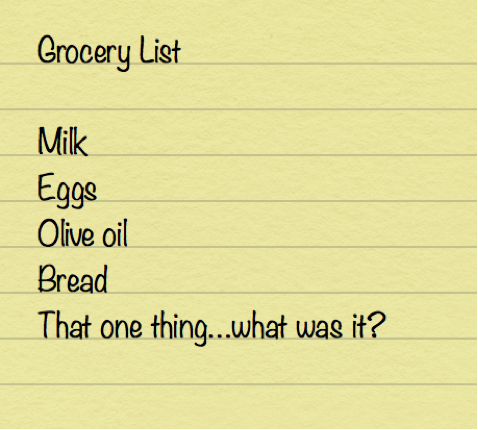 The crucial item on your grocery list will be the one you forget. Your actual grocery bill will be greater than or equal to 125% of the cost of the items on your list. A damp towel at rest will stay at rest until someone claims it, which is never. No more than 80% of any given family will like what you’re serving for dinner. The younger you are, the more cleaning product you will consume on a given household task, and the amount of cleaning product you consume is inversely proportional to how clean you get the actual surface. Of course, housework is the ultimate Sisyphean task, only the mountain is laundry and the rock is the one you want to knock against your head repeatedly until you no longer see the dirty dishes in the sink. This entry was posted in Family life, Household management and tagged housecleaning, housework, humor, laundry, natural law, parenting by Sarah Day. Bookmark the permalink. We’ll see how the week goes – I may come up with something else. I don’t have kids but two cats – and I can relate, too! There is probably another entire list for pet-related items. So far I’ve only issued the mantra through gritted teeth. Not going so well. This is just golden. Sisyphus often makes me think of housework as well, and vice versa, which improves housework, but not Greek mythology. How could you improve on Greek mythology? And yes, the comparison to Sisyphus is all to easy – the work that’s never really done. And how could housework fail to detract from it? At least with kids around there’s not the torture of *almost* getting to the top of the hill before everything rolls back down again. No kidding, I pretty much sit at the bottom of the hill. Ha! Well, that makes you smarter than Sisyphus in my books. I know, doesn’t it drive you crazy? It’s second only to my other favorited complaint: “All my pants have holes in the knees.” Oh, really? I have one child and he’s a toddler, yet all of these laws apply! Does that mean that I’ll have to go through this for years to come??!! Wow! I wish I could tell you it gets better but I would never lie to another mommy. Thanks for Turn It Up Tuesday – enjoying it! I love this list and think another one would be: Dust you think you vacuumed will somehow show up 5 minutes after you put the vacuum away. This is especially true when the control material is hardwood or laminate.